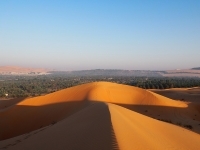 Numerous local tour operators in Abu Dhabi offer trips from the city to the famed Liwa Oasis, about three hours drive away along a modern highway. This green, agricultural strip at the edge of the Rub Al Khali ('Empty Quarter') is surrounded by desolate desert with farms abutting towering sand dunes. Visitors enjoy overnight camel trips to camp in the desert. The oasis, made up of a string of small towns and villages, is resplendent with pools of fresh water and date plantations, and is the ancestral home of the Bani Yas tribe from whence sprang Abu Dhabi's ruling family.